Before the legend of Peter Pan, there was Tinker Bell who was already engaging on adventures long before Peter and the Lost Boys visited Never Land. 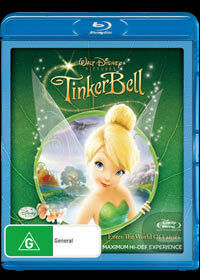 The DVD and Blu-Ray Tinker Bell is the origin of Tinker Bell and takes younger viewers on a journey of how it all started for Tinker Bell through the fantastic world of Pixie Hollow, a secret hideaway for fairies. With stunning animation, Tinker Bell explores the world of Pixie Hollow and how each fairy is born with an innate talent that begins this story. Unfortunately for Tinker Bell or "Tink" for short, she believes that her innate talent as "tinker" is not important and rather dull. This forces Tinker Bell to change who she is as she attempts to change her inner being that has devastating results on our little fairy. Fortunately for Tink, she is joined by her friends Fawn, Iridessa, Rosetta and Silvermist as they assist her rediscover her "Tinker" and journey into the mysterious borders of Pixie Hollow. Masterfully directed by Bradley Raymond, Tinker Bell contains a star studded cast that include Mae Whitman as Tinker Bell and also a variety of other stars such as Lucy Lio, Angelica Huston and Jeff Bennett. An exciting adventure from start to finish that also contains some brilliant Blu-ray special features. Great for kids of all ages!